Jim and Tara Herron are third generation dairy farmers. Together with Jim’s father David, the family raises 200 dairy cows and 280 heifers, and farms 1,000 acres at Cold Run Jerseys in Columbiana County, Ohio. What is the history of your farm, and why did you choose to become involved in dairy farming? David: My father started the main dairy operation back in 1945, and he had three sons. We all went into the dairy business and are all still in the dairy business. My father kind of instilled in us the work trait, and we like to instill that in our kids and in the next generation. Jim here is the third generation, and the little ones will hopefully have a chance at the fourth generation. Jim: I always enjoyed working on the farm. I didn’t know if I wanted to make a career of it or not, but once I developed a passion for it and Dad instilled work ethic within me, I just decided it was something I wanted to do. 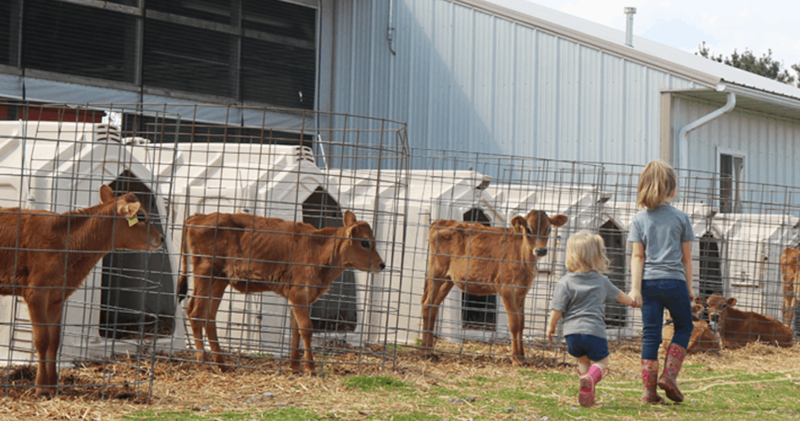 Hear Ohio dairy farmer Tara Herron explain how she cares for the calves on her family’s dairy farm. How do you manage manure on your farm? Jim: One aspect of the dairy that can be challenging is manure disposal. We have a 1 million gallon pit where we store our dairy manure, and we have it pumped out 3-4 times a year. We have about 1,000 acres, so we have plenty of ground to spread all of the manure on to have a safe level of nutrients on the fields. Cold Run runs right through our farm, so we have to be very careful. We watch the drainage outlets and make sure that we’re not putting it on too heavily. I live on the farm, and my whole family lives on the farm. We want to be very careful with our manure application. We don’t want to cause any problems with drinking water or any excess nutrients in the soil. How do you make sure the cows are healthy, well-cared-for and comfortable? Tara: We all really like to watch the cows throughout the day. You can tell when someone is a little off-balance and needs some attention, so we try to pull that cow away from the herd. We also have a really good system in our milking parlor. It’s a leg band system read by bands the cows are wearing. It feeds through this computer system and it tells us “hey, this cows not right today.” Same with my calves. It’s the same way I am as a mom with my kids—I’m watching them all the time. I can pick up if someone’s personality isn’t the norm, and I try to get that taken care of quickly.